We all know that you can buy all-natural peanut butter in a tub at the health food store or "Teddy" brand peanutbutter in the megamart. However, most of us grew-up with the sweetened, creamy store brands that don't separate into oil and peanuts when left standing. 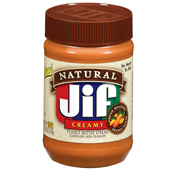 Jif recently came out with a "Natural" peanut butter product that I find as-good as regular Jif if not better. Taste & Appearance: The taste, as I mentioned, is as good if not better than regular Jif. If your kid's palate is good enough to tell the difference, I'll be very surprised. It won't separate like other natural peanut butter but it will get a little glossy on top when left sitting at room temperature. A quick stir of the knife helps before spreading it. Ingredients: The ingredients are all readable and reasonably healthy. In order to keep it from separating, they use some trans-fat free relatively healthy oils in the blend. The first ingredient is peanuts and it's sweetened with cane sugar and molasses instead of high-fructose corn syrup. I highly recommend adding this product to your pantry. Have you tried Skippy's natural peanut butter? I've always been a Jif girl, but I love Skippy's natural. Maybe Jif's is even better? Cathy commented on this (although via Facebook) and said she didn't like the Skippy one. I haven't tried it. I generally buy both Skippy and Jif for regular peanutbutter, so I suspect I'd like it unless they did a poor job formulating it.